Marubeni is heavily involved in coal power production. In 2017 it supported projects totaling more than 13 gigawatts of new coal production in nine countries. Campaigners in Japan and globally have been calling on the company to start phasing out of coal, consistent with the Paris Climate Agreement targets. In September 2018, Marubeni announced in a surprise move that it intends to halve its coal-fired power capacity by 2030. In an official statement (Sep 18, 2018) announcing the move, Marubeni notes that "as a general principle" it will "no longer enter into any new coal-fired power generation business." It is also noted, however, that "Marubeni might consider pursuing projects that adopt BAT (“Best Available Technology”, which at present is USC: “Ultra-supercritical steam generating technology) and are compliant with the policies and measures of the Japanese government and any country in which the project will be executed (e.g. energy supply stability, poverty and employment measures and economic growth policies)." Marubeni is a large Japanese trading company, founded in 1858. It has intrests in in- and export, as well as transactions in the Japanese market related to food materials and food products, textiles, materials, pulp and paper, chemicals, energy, metals and mineral resources, transportation machinery, and offshore trading. It is Japan's fifth largest sogo shosha: general trading companies that trade in a wide range of products and materials. The company's activities also extend to power projects and infrastructure, plants and industrial machinery, finance, logistics and information industry, and real estate development and construction. Additionally, Marubeni conducts business investment, development and management on a global level. Marubeni is listed at the Tokyo and the Nagoya stock exchange. The company's share holder structure can be viewed here. In 2017 Marubeni was involved in new coal power projects (totaling 13 Gigawatt) in Botswana, South Africa, Egypt, Vietnam, Indonesia, Thailand, Myanmar, the Philippines and Mongolia. Many of these countries have no or little coal plant capacity, which means that they will be locked into a coal-dependent future for decades to come. Marubeni is the 11th largest coal power developer in the world by total planned coal power expansion capacity. Developing these plants will lead to heavily increasing the amount of CO2 into the earth's atmosphere and thereby accelarating climate change. Building new coal power plants is completely at odds with the Paris Agreement; every new coal power plant is inconsistent with limiting global warming to well below 2 degrees. 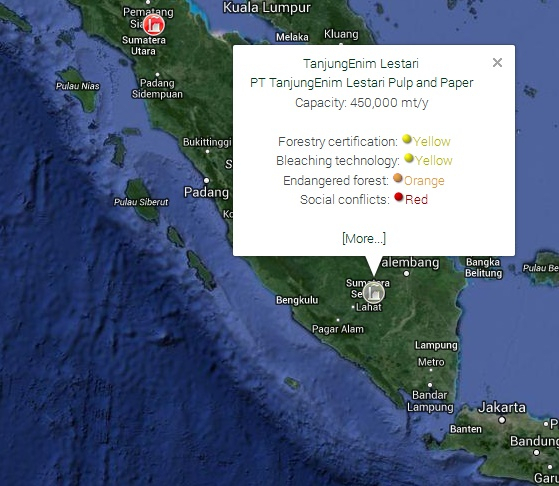 In 2013, a Marubeni subisdiary, PT Tanjungenim Lestari Pulp and Paper PT TEL, operating in the Indonesian province of South Sumatra, has claimed that the wood chips it uses as raw materials are sourced "from 100% plantation logs which are sustainable and FSC CW (Forest Stewardship Council Controlled Wood). However, in 2013 Greenomics published a report accusing PT TEL of sourcing wood from Sumatran Tiger Habitat, of not conducting a HCV forest assessment and of not being transparent about the wood chips it buys from 'community forests'. Marubeni's Indonesian subsidiary, PT Musi Hutan Persada, large land concessions overlap with a number of the customary land tenures of local communities. These overlapping tenure and use rights, created when the PT-MHP concessions were granted, have been a source of significant social conflicts between the company and various local communities. In January 2014, the Indonesian organization WBH and Rainforest Action Network filed a complaint against PT MHP's FSC certification. Communities located in the Martapura district were forcefully evicted from 2,700 hectares of land. Their crops and houses were destroyed in 2011. As of December 24, 2013 no conflict resolution process had been agreed to, between the company and the communities, to remedy their alienation from use of their lands, the destruction of their houses and crops and forced relocation. PT-MHP holds a FSC Controlled Wood certificate, with registration number SA-CW/FM-002179, issued by the Soil Association Woodmark, an accredited certification body with the Forest Stewardship Council (FSC). WBH has also compiled evidence of cases in Muara Enim, OKU Timor and Musi Rawas districts of ongoing community disputes with PT-MHP over land tenure and use rights, including cases of forced displacement by armed security forces and the destruction of their homes, rubber trees and gardens. Soil Association Woodmark broken their relationship with PT WBH, but in May 2014 PT MHP obtained a FSC certificate issued by SGS for 296,400.00 ha, with registration number SGS-CW/FM-010071. According to a Marubeni press release: Marubeni Coporation has agreed with Korea Midland Power Co., Ltd., Samtan Co., Ltd., and PT. Indika Energi Internasional to jointly develop the Cirebon 3 Coal Fired Power Plant (1,000MW) in the area adjacent to the Cirebon Coal Fired Power Plant Project and the Cirebon 2 Coal Fired Power Plant. Marubeni press release: On March 2, 2016, Marubeni Corporation and El Sewedy Electric Company S.A.E executed a Memorandum of Understanding with Egyptian Electricity Holding Company in relation to a feasibility study of the construction of an ultra-supercritical coal-fired power plant in the Arab Republic of Egypt. The Egyptian government has announced a policy to install approximately 12.5 gigawatt worth of new coal-fired power plants by 2022 in order to diversify energy resources. Under this MOU, Marubeni and El Sewedy will conduct a feasibility study for constructing a high-efficiency ultra-supercritical coal-fired power plant in the West Mattrouh region. Between 2014 and 2017 35 financial institutions (FI) have, in total, loaned USD 16.027 billion to Marubeni and provided underwriting services amounting to a total of USD 906 million. Below is a list of banks and other FIs involved in this financing. project finance for the development of the Antucoya copper mining, provided together with JBIC, EDC, KfW, Mizuho Bank, Sumitomo Mitsui Banking Corporation, Natixis, ING and Corpbanca. project finance for the development of the Antucoya copper mining, provided together with JBIC, EDC, KfW, Mizuho Bank, Sumitomo Mitsui Banking Corporation, Natixis, ING and Banco del Estado de Chile. project finance for the development of the Antucoya copper mining, provided together with JBIC, EDC, KfW, Mizuho Bank, Sumitomo Mitsui Banking Corporation, Natixis, Corpbanca, and Banco del Estado de Chile. project finance for the development of the Antucoya copper mining, provided together with JBIC, EDC, Mizuho Bank, Sumitomo Mitsui Banking Corporation, Natixis, ING, Corpbanca, and Banco del Estado de Chile. Syndicated loan worth USD 250 - Nordea was one of the banks involved. Matured in 2007.
syndicated revolving credit - 10 year syndicated revolving credit, worth in total USD 50 million. project finance contract for the development of the Roy Hill Iron Ore Mine in Australia, provided together with KSURE, Ex-Im Bank, JBIC and NEXI. project finance for the development of the Antucoya copper mining, provided together with JBIC, KfW, Mizuho Bank, Sumitomo Mitsui Banking Corporation, Natixis, ING, Corpbanca, and Banco del Estado de Chile. project finance contract for the development of the Roy Hill Iron Ore Mine in Australia, provided together with KSURE, Exim bank of Korea, JBIC and NEXI. to develop the Westermost Rough Offshore Wind Power Project; jointly financed with The Bank of Tokyo-Mitsubishi UFJ, Ltd., Mizuho Bank, Ltd., Siemens Financial Services (Germany), and Societe Generale Corporate & Investment Banking (France). project finance contract for the development of the Roy Hill Iron Ore Mine in Australia, provided together with KSURE, Exim bank of Korea, Ex-Im Bank and NEXI. project finance for the development of the Antucoya copper mining, provided together with EDC, KfW, Mizuho Bank, Sumitomo Mitsui Banking Corporation, Natixis, ING, Corpbanca, and Banco del Estado de Chile. project finance contract for the development of the Roy Hill Iron Ore Mine in Australia, provided together with Exim bank of Korea, Ex-Im Bank, JBIC and NEXI. project finance contract for the development of the Roy Hill Iron Ore Mine in Australia, provided together with KSURE, Exim bank of Korea, Ex-Im Bank and JBIC. There are no projects active for Marubeni now.